Don, I use the right eye from my days in ENG and no problems with the loupe at all - in fact it feels very comfortable. I always get the comment "whats that on the camera". I tell them, show them the viewfinder and it's always "wow". It also balances the camera very well. Well, I sort of take it back. The right angle HDMI connector fits with some fidgeting before you get the loupe on but it limits the loupe's freedom of movement as the photo will attest. I know that a camera mounted HDMI monitor and the loupe at the same time makes little practical sense but it's what I have to test it with. The HDMI plug limits the swivel to about 20 degrees.which sort of defeats the best aspect of the loupe. Correct, I was going to comment on the feasibility of using HDMI with the loupe after your previous post. I often look down in to the loupe, which requires it to be tilted up - which is not possible with an HDMI cable. Too bad, I could see using an external monitor at the same time as a loupe a great thing - especially with a director or crew monitoring alongside a cameraman. But, like you said, it is possible as long as you are OK with the limited range. I recently shot an impromptu test video using the loupe. You can get an idea of how stable (or unstable?) my shots are when using a loupe during handheld shooting. The loupe becomes a 3rd point of stability - and in my opinion helps stabilize handheld shooting without a rig. Considering the situations I would use the loupe and the situations I would use the HDMI port, there is little reason to need both at the same time. And your footage does show how the loupe gives a very needed point of stability to the camera. Next test: the loupe and my shoulder rig. I'm kind of excited about that too. 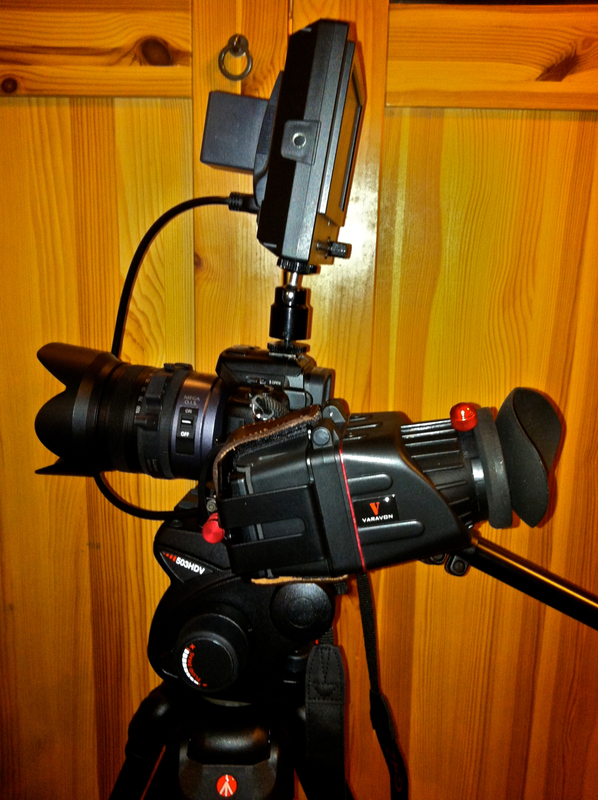 So far the GH2 has been a tripod only affair because I can't steady it. It works well on a Spiderbrace shoulder support. 85% as the Spiderbrace isn't adjustable but I could accomplish great walking shots while looking trough the loupe. I might shoot something tomorrow and post it. Edit: It's raining so the outdoor test will have to wait. I recommend this product to anyone thinking about using a GH2. It is well worth it. Welllllll, I got mine and it was the fixed version. I called Amazon and raised ****. They were out of them so they subbed this one. It's on it's way back and I ordered another from a vendor that didn't offer it as prime so it will be Monday. It's been a bad week so far. I bought an upgrade from Adobe for CS5 to 5.5 which included a free upgrade to 6. The update wouldn't load and I just found out the OEM 5 I have isn't an OEM....never buy from Ebay, never, never, never again. I feel your pain............Ive been there more than once and hate the hassle. Ive had good and bad luck buying from Amazon. I normally buy any new stuff from B&H and have never been dissatisfied with their service. I finally got it and have a few initial observations. 2. The optics are clean, clear and distortion free which is a God Send after wrestling with a Hoodman. 3. It's sturdy and seems to be well made. 4. On some site, someone asked if anyone over 50 had one and was the diopter adjustable enough. I'm well over 50 and yes, the diopter seems to have plenty of adjustment. My thoughts to this point is that this is one of the best deals I've made in a long time. I got mine today.....and I feel its worth the money. Especially in daylight shooting. Like, Don the hoodman was useless to me. I need the magnifier plus the shade and this offers both. I was worried it would not fit correctly with using GH2 battery grip. 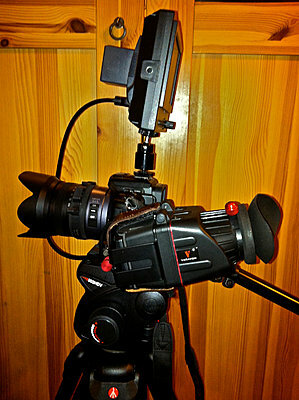 The battery grip is made to "form fit" the GH2..and I cant do without it. Fortunately, the battery grip will mount "under" the loupe bracket with only 16th or 32nd inch opening......The mounting screw that mounts the battery grip to the camera is long enough to pass through the loupe bracket....so both the grip and loupe mount well and look good too. You can take the loupe off with one thumb screw for storage...leaving the loupe mount on the camera...cool. Good investment............but Im buying NOTHING MORE THIS YEAR!!! !...did everyone hear that ? ...don't tell me, there's one on Ebay ?? I wish I could say that Jeff. I am moving equipment around some though, and hopefully won't spend much. I decided yesterday to sell the 7D and at least put the money aside. I'm going to pass on Black Magic for now. There are a lot of bugs for them to work out. There's a very good market for the 7D bodies around here so I'm going to pull the trigger and get rid of a few of the lower end cameras I got for special projects as well. Then I'll sit back and see what shows up to improve the business. On another site, a fellow who has one says to be careful not to let the sun shine in it for any length of time. He said it melted the bezel on his camera.